The Citroën 2CV was born at a time when most cars were not available to the general public. Affordable and low maintenance, this little car quickly distinguished istself and seduced the entire French population. Early in the twentieth century, André Citroën strongly believed that future automobiles must be accessible to the general public. He analyzed American manufacturing methods and produced a large number of vehicles. The French market was behind compared to the United States, and André Citroën saw the unique opportunity to meet the expectations of the French people. Working hand in hand with Michelin, the tire specialist, André Citroën had the bold idea to create a car that offered the working class the opportunity to acquire a reliable vehicle at an affordable price. 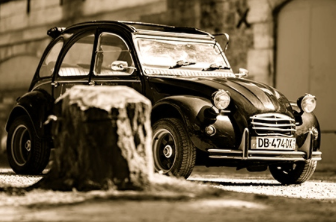 With the help of the businessman Pierre Jules Boulanger, the engineer André Lefebvre and the stylist Flaminio Bertoni, Citroën made his dream a reality and created one of the most legendary French cars: the 2CV. Citroen combined his vison with the ideas of the other founders to create this small yet unique car. Nine years later in 1939, the first prototype of the Citroen 2CV was placed on the market and 250 cars were ordered for production. Unfortunately, the beginning of World War II caused the project to be suspended. It was not until October 7, 1948 that the Citroen 2CV made its first public appearance at the Cars Show in Paris. Its presentation created amazement from the biggest sceptic to the car enthusiast, as all were impressed by its revolutionary flexible suspension and sleek design. The growing reputation of the 2CV was created by its image. It was seen everywhere, in all type of weathers and on any road. This little car had everything a big car had, and the press flattered it: “affordable, reliable vehicle, comfort, ease of use …” The legend of Citroën 2CV was on its way. In the 1950s, the 2CV, now nicknamed “La Deudeuche,” lived its glory years. The cheapest car in its class, it became increasingly popular, with over 100,000 cars sold in 1957. Building on this success, Citroën launched several varieties of the 2CV: a utility version in 1951, a 4 × 4 version in 1958, and later the deluxe model with a sunroof. Next came the export of this legendary car. England, Belgium, Spain, Portugal, Yugoslavia, Chile, Argentina, Vietnam, Iran … No one could stop this great success. 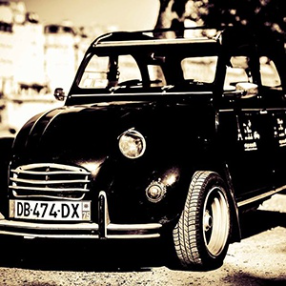 Sleek and unpretentious, the 2CV was associated with hippy movement in the United States and became an unavoidable car in many French films like Le Gendarme de Saint-Tropez or The Sucker. Synonymous with adventure, the 2CV was also used for international raids in Mediterranean countries, America, and Africa. The 1980s saw sales of the 2CV drop below 100,000 cars. However, it continued to be produced for another 10 years, specifically for the German market. Production of “la Deudeuche” stopped in 1990, but its historical legacy isn’t over. With over 5 million copies sold worldwide, the Citroen 2CV is an unparalleled global automotive success! 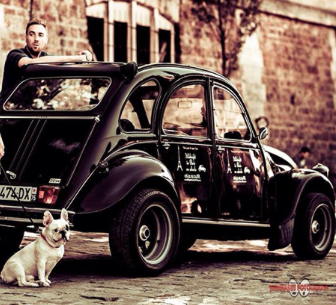 Did this presentation of the Citroen 2CV make ​​you want to explore the city on four wheels? You want to discover the authentic Paris in a unique and private visit? Book your 2CV tour now via our contact form, or call Nicolas at the number listed below for more information.